The Name Says it ALL. This glove is the SHIELD that protects your hands from hazards on your job. Available in a 7 mil fingertip short cuff (SC-9.5”length) and an 8 mil fingertip long cuff (LC-12”length) Vital Shield SC and LC offer several options to meet your glove requirements. Our SHIELD passed UL testing and received NFPA certification. We know the jobs you perform can be dangerous and a shield of protection is vital. Get the protection you require and deserve! 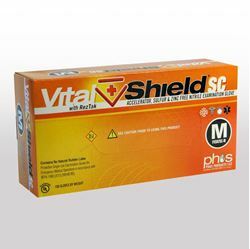 Vital Shield SC and LC offers exceptional protection and a superb fit. Vital Shield is a better alternative medical exam glove that is soft and comfortable with the fit and feel of latex yet the protection of protein free synthetic nitrile. 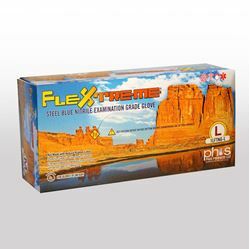 Manufactured using a formula free of Accelerators, Sulfur and Zinc to enhance tensile and elongation strength. The white color immediately allows you to see exposure to bodily fluids or chemicals.